The tour begins at my guide’s favorite bench, by the spine facing the creek that runs through campus. 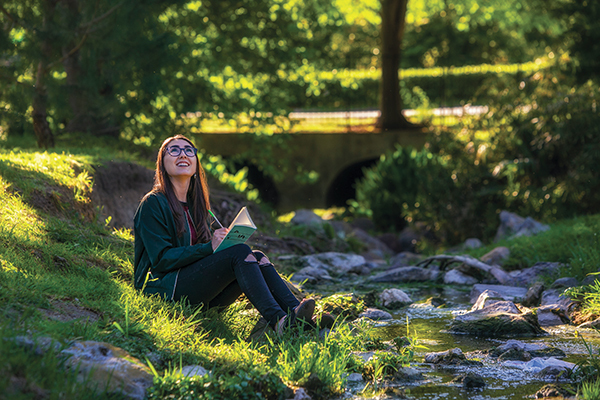 During her time at Cal Lutheran, Emily Chebul ’17 sat there three or four days a week “for anywhere from half an hour to upwards of two hours” to watch animals, mostly birds. Anyone with peripheral vision can take up Chebul’s hobby, anywhere on Earth. While earning a degree in environmental science, she added the campus boundaries to the collaborative citizen science platform iNaturalist. She has posted observations of mice, moths, beetles and bees from around Los Angeles, including near her volunteer job at the La Brea Tar Pits. This map will help if you’re getting started. If headed toward the campus’s edges, especially the hills above Olsen Road, be aware of ticks and know what a rattlesnake looks like. Download apps to help narrow down birds and other species by shape. Chebul taught herself to spot living things while catching snakes and lizards in Santa Clarita from age 5 or 6. She was excited this spring to find a western kingbird in pursuit of a butterfly, since she’d never seen one. For almost two years, she watched a pair of red-shouldered hawks bring in material and build two nests high over Memorial Parkway. On my tour, she also showed me a white-crowned sparrow’s nest by Ullman Commons. Chebul is a little self-conscious about being seen staring into bushes. She puts her birdseed out at night. Find the Biodiversity of California Lutheran University page at iNaturalist.